Flowers are the reproductive structures produced by plants which belong to the group known as Angiosperms, or 'Flowering Plants'. This group includes an enormous variety of different plants ranging from buttercups and orchids to oak trees and grasses. There are about 250,000 known species. A flower is basically made up of four concentric rings of structures. There is an outer ring of modified leaves called sepals. These provide protection to the flower before it opens and are usually green. This outer ring is known as the calyx. Inside the sepals is another ring of modified leaves called petals which are often brightly coloured. This layer is known as the corolla. Within the corolla are one or more stamens containing pollen, which are the male reproductive structures. In the very centre of the flower are the female reproductive organs. 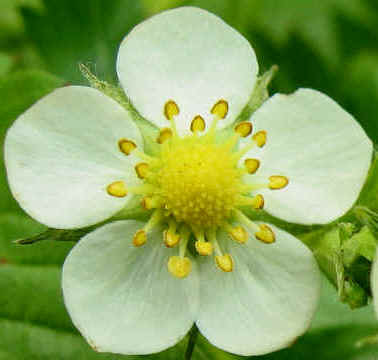 The female parts of a flower consist of an ovary, which contains one or more ovules, a style and the stigma. The ovary is at the base of the flower. 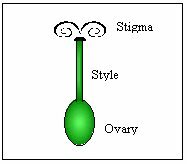 From the ovary, extends a tubular structure called the style and on the top of the style is a surface receptive to pollen called the stigma. The stigma can take many different forms, most of them designed to help trap pollen. There are many variations on this basic structural theme. The male parts of a flower consist of one or more stamens. Each stamen is made up of paired anthers (sacs containing pollen) on a filament or stalk. 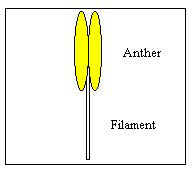 The anthers are the orange/yellow structures often seen in the centre of a flower. Pollen from the anthers of one flower is transferred to the stigma of another usually either by wind, or by animals, especially insects. Flowers do not always have the two outer layers of calyx and corolla. These two layers are most noticeable in plants which are pollinated by insects. The corolla, or petals are often brightly coloured with markings attractive to insects. The flowers may also be scented. For instance, Honeysuckle has showy, attractive flowers which attract insects by day. However, in the dark, their colourful show is not much use, and their heady scent then helps to attract night-flying moths. In insect-pollinated plants, there are also usually nectaries which secrete sugary nectar, located within the flower. These provide an incentive to insects to visit the flowers. In the search for nectar, the insects will often get pollen grains caught on their bodies. This may then brush off onto the stigma of the next flower visited and in this way the flowers are pollinated. Many flowers have evolved very specific associations with a particular insect species or group of species. In these cases flower structure may be very specialized (e.g. orchids). Foxgloves (Digitalis purpurea) and Primroses (Primula vulgaris) show a range of adaptations to insect pollination. Wind pollination is also common in flowering plants. 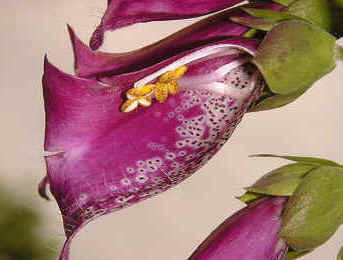 In this case, because there is no necessity to attract insects, the calyx and corolla of the flowers may be absent. This is a cross-section of a Foxglove (Digitalis purpurea) flower. It has been cut across the centre of the flower from top to bottom. The purple structures are the petals. The white circular markings on the petals act as guide lines, directing insects towards the nectaries hidden in the base of the flower. The green outer structures are the sepals. The female reproductive structures are hidden, but the stamens with their yellow anthers are clearly visible at the top of the flower. Once a pollen grain reaches the stigma of another flower of the same species, it will produce a pollen tube. This grows down through the style until it reaches an ovule. Fertilization then takes place, resulting in a seed. When pollen from one flower fertilizes the ovule of another flower, it is called cross pollination. If an ovule is fertilized by pollen from the same flower, it is called self fertilization. In evolutionary terms, this is generally not particularly favourable, as it leads to inbreeding. Most species therefore tend to be cross pollinated. In this case they need something to transfer the pollen from one flower to another. This might be insects, birds, wind or water. This need to use an outside agent to transfer the pollen has led to the extraordinary variety of shapes, colours, scents and arrangements of flowers seen today.